If you think Jean-Michel Jarre and Vangelis when hearing "synthesizer", this might be the music for you. Adam Certamen Bownik Lublin, Poland does not only work as a professor at the University in Lublin, but also was a drummer and vocalist at the death metal band "Certamen". 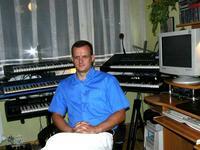 The upcoming of analog synthesizers made it possible that we can now hear his great compositions. Is there any better music to dub a scientific video with? I doubt it. A good example my be the album "Red Planet".